This blog post has been a long time coming. Many of you are probably wondering why there's been practically no activity on the project for several months now. In fact, the last serious development activity was when v2.1 beta was released just prior to DevCon'2011 back in October. Furthermore, my participation on e-mail/tickets/forums has also been rather slow or absent since then. A lot of things have been going on in my personal and professional life since early October, and these things have seriously cut into the time I used to devote to the LogicMail project. What many people often forget, is that the LogicMail project has essentially been a hobby of mine from day one. During most of the lifetime of the project, I tended to be single, work a non-mobile-related day-job with a early schedule and little overtime, and had a lot of evening, weekend, and holiday hours to devote to the project. Starting around October, a number of things happened. Owing in large part to my work on LogicMail (and related BlackBerry developer community involvement), I got a job doing full-time BlackBerry development with a company located in California. Of course I was living in Florida, and working from home with co-workers 3 hours behind me, so work/life separation was a bit of a challenge. Now, while I was still working from home at this point, my new employer considered that to really be a temporary arrangement. They actually wanted me to be local at their office in California. So we spent most of December and January going through the whole stressful relocation process. After being quite "settled in" with our existing lives in Florida, this was understandably a major ordeal. Its now early February, and we're finally starting to settle in at our new place. As such, I'm thinking its about time to begin to follow up on all the LogicMail activity I've mostly put on the back-burner since October. Now many of you are wondering what my plans are, going forward, with the LogicMail project. On one hand, my ability to continue contributing has significantly declined. But on the other hand, the project is sufficiently feature-complete for many users. The first thing I plan to do, is to change the release model. In the past, I've attempted managed "release branches" like a more major project might do things. This meant that I would be doing active development on 2.1, while continuing to commit bug fixes for 2.0, as an example. In the future, I'm going to adopt more of a rolling-release model. So for all intents and purposes, there will be one main branch of the source code. Whenever a particular build is deemed "good enough", I'll link to it as the new "release" from the download page. Since v2.1 is really already good enough for wider-than-beta usage, I'll be starting with this version as soon as I can bring my development and build systems up to date. The second thing I'd love to be able to do, is somehow get people other than myself to contribute (beyond translations) to the project. While I've seen plenty of users think that there's a "team" behind this project, it has really just been myself. Occasionally I get minor contributions, but really nothing substantial has come from anyone else. Now I'm pretty firmly convinced that there isn't much of an open-source culture in the BlackBerry world to begin with, so I don't know what it'll take. (I think most of my would-be contributors are either put off by the need for Windows to run the development tools, or have long since switched to Android. Heck, all my friends still wonder why I haven't switched.) I may even consider switching the repository from SVN to Git, but right now I'd be happy just to have a reason to consider that. 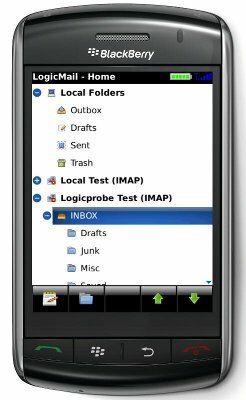 I'm happy to announce the initial public beta release of LogicMail 2.1! This release builds on the capabilities of 2.0, and adds in the most user-requested feature of all time, background message polling. I may still add a few more minor features during the beta period, but my time is limited and I want to get this out there. Note: Some of the non-English translations may be out of date. I hope to get those updated over the next few weeks. Now that LogicMail 2.0 has been released for a while, I figured it was time to give everyone a little update on the progress of 2.1. Back when I first started making LogicMail publicly available, there was a certain feature everyone was asking for. In fact, people weren't just asking for this feature. They were so certain that they had to already be there, that they were actually asking me how to configure it! If it isn't obvious by now, this feature is having LogicMail sitting in the background, polling periodically for new messages, and notifying the user. Oh and it should be easy, right? As I mentioned in this presentation on the evolution of the project, sometimes "a simple-sounding feature may take a redesign of the whole application to implement properly." You see, LogicMail 1.x was really a very simple proof-of-concept application. It had a user interface, some mail protocol code, a thread or two to glue them together, and little else. There was simply no way to actually implement such a feature. The reason it took so long to get LogicMail 2.0 completed, was because I was building a full-blown application almost from the ground up. Oh, and I was doing it in my (limited) spare time. The longer it took, the most likely users were to have issues or make feature requests. This all made it take even longer. When LogicMail 2.0 was finally approaching completion, I had a tough decision to make. I could hold out for server polling, and delay it another few months, or I could bump that highly-requested feature to 2.1 and release what I had then and there. Since the simplicity of 1.x was making the project look stale and dated, and polling would create a testing nightmare, I decided to go ahead and just release 2.0. Now that 2.0 is released, and out of beta, I've been able to focus most of my attention on 2.1. Work has been proceeding quite well, since I'm now building on top of a completed application. I have refactored some big things in the core, but those were things I wanted to rework for a long time. 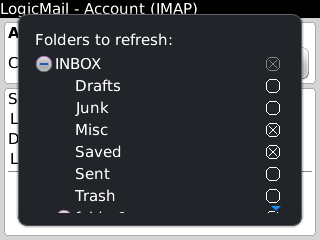 IMAP: I actually use IMAP IDLE most of the time, monitoring the Inbox. Whenever the "refresh frequency" period elapses, I leave IDLE mode to make sure the server knows we're still alive and to check any other mailboxes. If there is a connection error, I also use this value as the amount of time to wait before trying to connect again. POP: This is simply how often I connect to the server, check for messages, then disconnect shortly thereafter. Some tweaking is still needed here, so that LogicMail will disconnect slower or faster depending on user activity. Don't worry if you have an older device, as the older menus are all still there for this. The newer ones just make for nicer screenshots. There are also a lot of little end-user feature requests, most of which are likely to get pushed to 2.2 in order to get 2.1 released faster. However, since LogicMail is an open-source project, any interested developer can work on them and contribute the code back to me. Its been several months since the beta release announcement, and I'm finally ready to declare LogicMail 2.0 as released! Throughout the beta, I was able to find and fix a lot of issues. Most of these issues are listed in the ChangeLog. Throughout the beta, I've considered the application to be in "string freeze". As a result, the overall look and feel hasn't changed. Able to read E-Mails written in many different languages and character encodings. For a walkthrough of downloading and installing with screenshots, visit the Setup Guide! P.S. 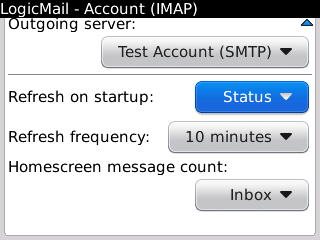 You do still need to know how to setup an E-Mail client to talk to your E-Mail service (via IMAP/POP/SMTP). This really isn't that difficult, and the settings are no different than what you'd use with any other desktop E-Mail client. There are still a number of known issues with 2.0, which will be fixed with future patch updates. However, none of them were deemed important enough to block the release. The most noticeable of these issues is the need for better detection and handling of stalled network connections (#315, #285). As mentioned in the beta release announcement, the most user-requested feature of all time (background server polling) had to be postponed to 2.1. It is currently under active development, however, and will be available for testing in the not too distant future. Every once in a while, I've seen users complain that LogicMail behaves strangely when trying to access Gmail. They usually say that it only loads the oldest messages, instead of the newest ones. While actual configuration details are rarely given, I did finally luck out on this discussion thread. The gist of it is that these users are configuring LogicMail to access Gmail via POP, and they are seeing the wrong messages at the top of their Inbox. Once reconfigured to use IMAP, this problem goes away. That all being said, I did still want to investigate. Did I have some strange POP bug I was previously unaware of, or was something else going on? Gmail already has a pretty bad reputation in the IMAP world, as far as standards-compliance goes, possibly even likened to the reputation IE6 had on the web. However, I had not previously run into user-reported issues with Gmail and IMAP. Could there be issues with POP as well? While I'm normally a FastMail user myself, I do keep a Gmail account around for testing (and access to other Google services). So I decided to do a 3-way comparison. Okay, looks like 154 messages, of which the first several are auto-generated Trac ticket modification notices. "Wed, 04 May 2011 21:05:04 -0000"
"Re: [LogicMail for BlackBerry] #170: Implement BrowserField2 for OS 5.0"
"Sun, 08 May 2011 19:58:06 -0000"
"Re: [LogicMail for BlackBerry] #301: Support updating Draft messages in local folders"
"Mon, 09 May 2011 00:05:04 -0000"
"Re: [LogicMail for BlackBerry] #79: Implement server polling"
"Tue, 17 May 2011 02:05:04 -0000"
"Re: [LogicMail for BlackBerry] #325: Add support for the IMAP COMPRESS Extension (RFC4978)"
This time, the Inbox contains 183 messages! Of course the web interface may present its content differently, so it may not be the end of the world. But what's important to note is that the same messages are at the top of the mailbox. Did you see that? 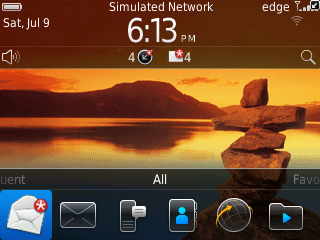 POP now tells us there are a whopping 268 messages, and the first couple are a bunch of old Google Buzz notifications! No wonder users accessing Gmail via POP were seeing strange results. So what have we learned from this? It is actually Gmail's fault that POP users are only seeing old messages. The obvious recommendation is to only use IMAP when accessing Gmail. That being said, if your mail service of choice supports IMAP, then you really should never use POP. The reasons have absolutely nothing to do with the above issue, however. IMAP is a far more sophisticated and efficient protocol, and will work a lot better with clients like LogicMail that try to optimize their data usage and local storage needs. For a walkthrough of downloading and installing with screenshots, visit the new Setup Guide! Its been over a year since the last 1.x maintenance release, and more than two years since the bulk of my effort shifted to the 2.0 code. With all the people that have been actively running the development builds over the past year, its about time that this code went out to the masses! Through the beta period, we'll be working on fixing any remaining bugs and bringing all the translations up to date. While this first beta build is English-only (for the application text), I hope to have many more translations included in future beta releases. Now for the caveats... Unfortunately, the most user-requested feature of all time (background message polling, #79, #79, #169, #212) had to be postponed to 2.1. This was a difficult decision, and it took a lot of thought to arrive at it. It took a lot of time and effort to bring the application's architecture up to the point where it was possible to implement this feature in the first place. Now that we're there, its simply a matter of time and resources. Its the sort of feature that may not be too difficult to implement now, but will be a nightmare to test and debug. If I had held out for it, then 2.0 might take another few months to get to release. Given how long its been since 1.1, I felt it was more important to get 2.0 out now, in its current form, and just make 2.1 my next priority. 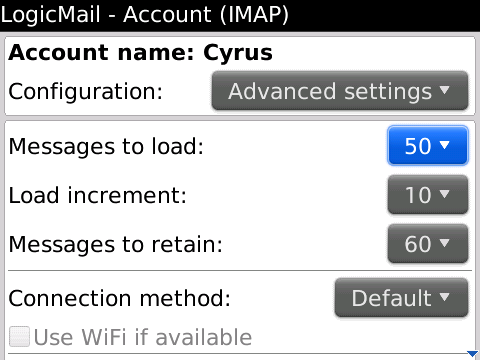 As of the latest development build (1.9.1.221), the oldest version of BlackBerry OS supported by LogicMail is now 4.5. (It had previously been 4.2.) If you are one of the very few people still running an older BlackBerry with OS 4.2 or 4.3, please try to upgrade to 4.5. I only have OS 4.2/4.3 on my systems because I have older installs that I've updated. It only pretended to support OS 4.2 and 4.3 in the past. I could build, but the simulators never worked right, so I never tested on anything older than 4.5 anyways. This is an annoying dependency issue to figure out for a new developer freshly checking out the source code to LogicMail. Pretty much all OS 4.2/4.3 devices are upgradable to OS 4.5. Download statistics show that hardly anyone is using anything older than OS 4.5 anymore. Modified the Eclipse projects to that used to have a 4.2.1 dependency to now have a 4.5.0 dependency (LogicMail, LogicMailTests, J2MEUnit). Reconfigured the build server to generate 4.5.0 instead of 4.2.1. I'm now in the process of upgrading my oldest physical test device (an 8820) to OS 4.5. Over the next several days I'll be renaming any source files ending in "BB42", and trying to clean up my use of APIs marked as deprecated in 4.5. I recently had the chance to do another marathon coding week of LogicMail development. These rare opportunities allow me to make real progress, instead of just incremental fixes and features. While the majority of the work was deep in the guts of the application, the actual user impact should be quite welcome. This is where I store message headers (not contents) so refreshing your view of a mailbox is faster than re-fetching everything from the server. This cache can be intentionally wiped with a "Clear" button at the bottom of the main configuration screen. Makes this behavior far less messy and far more error-tolerant, allowing improvements in the future. The message list on the mailbox screen now shows a special "Load more messages..." item whenever there's a gap at which more messages can be loaded. 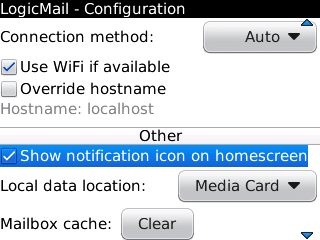 If your mailbox has messages which are not ordered by date on the server, this item might appear in weird places. "Messages to retain" - How many messages (total) to keep in the local cache (and reconcile with the server) if they've already been loaded. Opening a POP message now marks it as opened in the local cache. 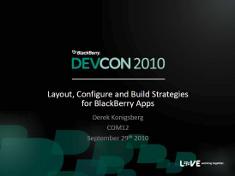 I recently attended the 2010 BlackBerry Developer's Conference, something I seem to be making a habit of, and had an overall good experience. It wasn't quite as eye-opening as previous years, probably because new developer tool announcements weren't aligned with the conference. However, there was still some good content. The best part? They've finally decided to make some of the content publicly available this time. You just need to go to the somewhat hidden BlackBerry Developer Portal, login, and find the link for "DEVCON10" in the middle of the page. I also had the privilege of presenting again this year. I spoke on a fairly technical topic, sharing a lot of my lessons-learned from building LogicMail across such a wide range of OS versions. I'm long overdue for another official post about the status of the LogicMail 2.0 project. So far, most of my commentary has been scattered between the forums, ticket system, mailing lists, and private E-Mails. As such, I think its about time I explained where everything currently stands. To put things in perspective, using the SLOC metric (as calculated by this tool, the final 1.1 release comes in at 13,579 SLOC. Meanwhile, as of today, trunk is at 31,427 SLOC and growing. A few hours here and there is plenty for following up on E-Mails, fixing minor bugs, or adding small features. However, the bigger stuff requires me to be able to dedicate whole days of development time. While I can do this on occasion, I am limited in how often I get the chance. Anyone who follows the development builds has probably noticed some of the slush after build [build:199] and hopefully ending in build [build:202]. This is where I implemented #221. It has made actual network loading much faster, but has had the side effect of making the post-processing seem slower. Hopefully #222 (a work in progress) should fix this. Now, we all really want 2.0 to actually get to a beta release sometime this year. As far as I'm concerned, the beta milestone is where the application is feature-complete, and most of the more major bugs are fixed (and/or well documented). In order to get there, I really need to focus on the core features. This may mean that every little user-request or issue won't get acted upon immediately. However, if they are documented in well-written tickets, they can still be mostly addressed prior to a final 2.0 release (or moved over to 2.1). If you follow any of the usual enthusiast and official websites, its hard to miss what's happened this past week. Amongst all the buzz, they also finally remembered to release an actual SDK to go along with it. So what did this mean for LogicMail? The number of existing LogicMail builds was growing out of control. I also had separate touchscreen builds for 4.7 and 5.0. So I started thinking to myself... Why do I actually have separate touchscreen and non-touchscreen builds? What am I actually saving by doing that? Apparently, only about 32kb! In an era where other developers can't figure out how to write a toy app in less than 1M, and I'm only in the 300-400kb range, it seemed silly to fuss over that little memory. I just spent the better part of a week at the BlackBerry Developer's Conference, and had an overall good experience. Had good times hanging out with Ronen from BerryReview, Jessica from CNET, Simon from IntoMobile, Monica from BlackBerry Motion, and even got to see the infamous Crackberry Kevin! Of course I also met up with Eddie from Weatherbug and Travis from GWAVA, both of whom I first met at last year's conference. A lot of exciting things are going on with the BlackBerry platform, many of which are continuations of what we started to hear about last year. As a developer, one of the most interesting items is the completely rewritten Eclipse Plug-in 1.1 that is now in beta. The original plug-in was considered to be a forceful mashing of the JDE and Eclipse, and did have its quirks. The new plug-in has been rewritten from the ground up, and integrates much better into the whole Eclipse framework. I've already installed it, of course, and will soon be migrating the LogicMail trunk over to using it. I recommend checking out the full list of Tools Announcements from the conference. Network API - This fixes the #1 gripe of us developers, and will help magically solve the "make LogicMail auto-detect which network connection to use" problem. I might still have to solve it manually for older devices, though. BrowserField API version 2 - This will provide a clean and easy to use mechanism for displaying HTML content. The current Browser Field is an abomination of a hack to get working, and I'm looking forward to having a cleaner option for newer devices. AutoCompleteField API - I'm sure I'll find some place to use this, possible for choosing message recipients, depending on how it works. While they weren't giving out free phones anymore, at least this year's presentations came with a lot more sample code. I'm drooling at getting back to the code now, and also eagerly awaiting the BlackBerry Bold 9700 coming to my carrier (T-Mobile) on Monday. Quick question: Has anyone actually seen an example of a tree widget that actually works well on a touch-screen device? Particularly one like the LogicMail folder tree, where each node can be expanded/collapsed as well as clicked? One of my constant side-projects that has finally come to fruition is support for building LogicMail against multiple versions of the BlackBerry API. The challenge is keeping a single code-base, while continuing to implement new features that become available. 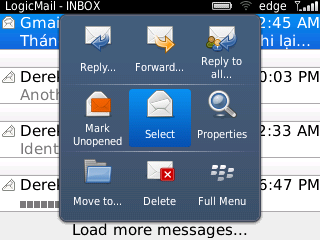 The initial drive for this, of course, is offering a better UI on the BlackBerry Storm (OS 4.7 and up). P.S. I've also updated the development page with instructions on how to use this new structure when working with the source code. As some of you may have noticed, I now have a second automated build of LogicMail up and running. On the main page, its referred to as the "Maintenance branch," and it reports its version as LogicMail 1.1. By now you may be wondering what this is, and how it relates to LogicMail 1.0.x and LogicMail 2.0 (a.k.a. "trunk" or 1.9). Well, I realized that 2.0 is still a ways away from being ready, and that I was starting to get more contributions for 1.0.x. The build process for 1.0.x was a bit of a pain, and debugging it was even harder, mainly because it was configured using this hack for Netbeans 5.5. Now that RIM actually has a usable Eclipse plug-in, life has gotten a lot easier. One of the best (or worst) things about developing an E-Mail application is dealing with internationalization issues. The early Internet protocols tend to assume that 7-bit ASCII US English text is the default, and everything else is the exceptional case. To this end, there have been many character sets and encoding formats created over the years. Today, we've at least managed to consolidate all the character sets into a standard known as Unicode. 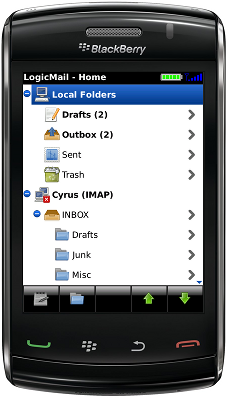 In addition, it has been discovered that East Asia localized BlackBerry devices also support GB2312. To make matters more interesting, Vietnamese characters will only display correctly if they are represented as decomposed Unicode characters. Meanwhile, most Vietnamese text on the Internet is represented as canonically composed Unicode characters. Users of LogicMail have occasionally run into issues where their non-English E-Mails do not render correctly. The most recent example involved a message that used the CP1251 character set for Cyrillic. However, I suspect that other similar issues have been noticed and have gone unreported. Believe it or not, Java SE 6 already includes libraries for this. But, the BlackBerry API does not. Including this in its complete form would dramatically increase the size of the LogicMail application, most likely by an unreasonable amount. Yes, that's right. I've finally gotten automated builds working again. This time I've decided to use the Bitten continuous integration system, which better integrates with Trac. It took a lot of frustrating work, spending too much time playing with Apache Ant build configurations, using BlackBerry Ant Tools, upgrading the Python installation on the server, and upgrading Trac itself for the heck of it, but its now all fully functional! The links for downloading builds are on the main wiki page as before. The actual build details can be found on the Timeline and Build Status tabs above. Now some of you are probably eager to go ahead and give it a try. Well, I'll warn you that its still not really ready for production use. At this point, I'd recommend only running it on a BlackBerry Simulator. If you want to use a real device, I suggest a spare or secondary unit. To actually track the progress towards 2.0, I've created the LogicMail 2.0 Progress page. I'll eventually scrub out all the relevant tickets, but for now this will serve as a more convenient checklist of sorts. 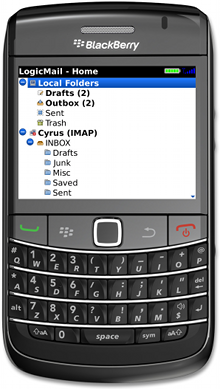 What BlackBerry OS versions is LogicMail running on? As a developer, I constantly have to ask myself this question. 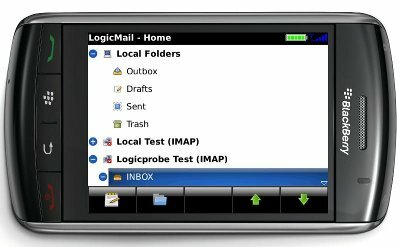 LogicMail 1.0.x currently supports 4.0 and 4.1. 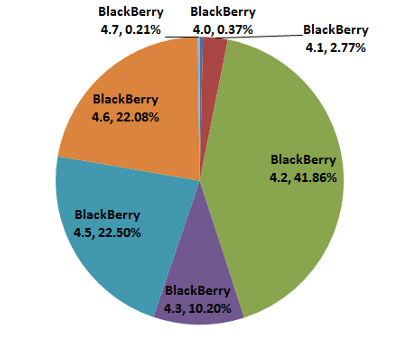 Most shipping devices run 4.2 or 4.3, the latest version that actually works on most of them is 4.5, and the newest BlackBerry models run 4.6 (Bold) and 4.7 (Storm). From this its obvious that very few people still run 4.1, and almost no one runs 4.0. Also, a few Storm users have tried it. I've been considering making 4.2 the minimum version for LogicMail 2.0, and this data validates that thought. Making 4.2 the base version allows me to depend on 4.2-and-up capabilities for some core features, like using the FileConnection APIs for local mail storage. I'm also considering offering additional builds for newer versions that incorporate extra features, such as SVG images and field borders that are now supported in 4.6. One of the big features of LogicMail 2.0 will be internationalization. That means I'd like the user interface to work in more than just US English. However, I'm personally only fluent in US English, so I'm going to need help with this one. I know I have a lot of users all over the world, so it shouldn't be too hard to find a few of you to help out with this aspect of the project. So what do you need to help? So if you're interested and willing, please write me at octo@logicprobe.org and we'll get started. 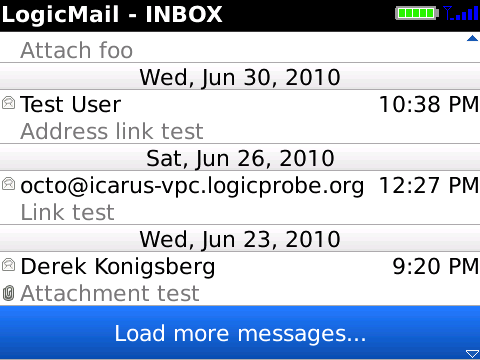 I've just released LogicMail 1.0.3, which is another bug fix release along the 1.0 branch. The fixed bugs include two IMAP server compatibility issues (#113, #114), and one memory issue (#115) I discovered as a result of some things I learned at the recent conference. For every good bug report I get, several poorly described and impossible to reproduce bug reports are written, so I hope that many of those issues are magically covered under the things I've fixed in this release. 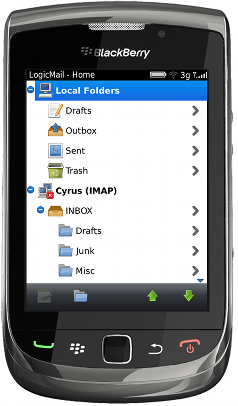 This new organization is primarily designed to make the RIM Eclipse plugin happy. The plugin is currently not very flexible on how you organize your project, and is easily confused. (I really don't think RIM even yet tested it on projects whose source is littered with hidden source-control support directories.) In order to make all the application code available to the unit-testing project, I had to basically make everything but the main() method into a library project. Also, so it wouldn't throw tons of unused-method warnings on the J2MEUnit itself, I had to move that into its own library project. 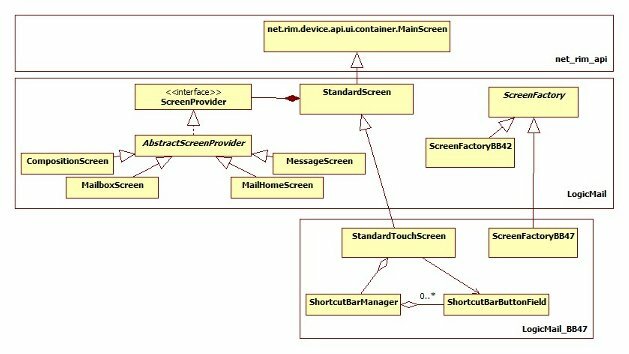 One thing to keep in mind is that all of this complexity is only to support working and debugging in the development IDE. I intend to keep actual official builds fully ant-based, and ant gives me far more flexibility. When building through ant, the only generated artifacts will be a complete "LogicMail" CLDC Application, and a complete "LogicMailTests" CLDC Application.